Sometimes life gets so mundane we can’t see our way out of the rut of our daily routine – when you can only see what needs doing rather than what you feel like doing. When I find myself in this state I know that drastic action is required. Another time this happened I signed up for the Minjin swing – being winched several storeys high up a metal tower and freefalling for several seconds before the swing kicked in and shot me out across the treetops at Kuranda markets. It was such an adrenalin-rush my knees were knocking so much afterwards I could barely stand. Great fun. So this time I was sitting around feeling swamped by all the weeds that had overtaken my garden when I thought of Richard Branson. Now that’s a man with a sense of adventure. I can’t imagine he even lets the word “boredom” into his vocabulary. He’s a superman of extreme action! Now by the Law of Attraction, what you think you draw to you. And what you think about with emotion comes even faster. So, as it happens, the last time I felt really excited was watching a TV segment about this great new sport of Flyboarding. It looked fantastic – the presenter hovering above the water like a superhero with white water jets streaming out below his feet like some rocket exhaust. It was a case of Marvel Comics’ Ironman meets King Neptune – or science-fiction meets reality. So a few days after musing over “what would Richard Branson be doing now” I was offered the chance to go Flyboarding. 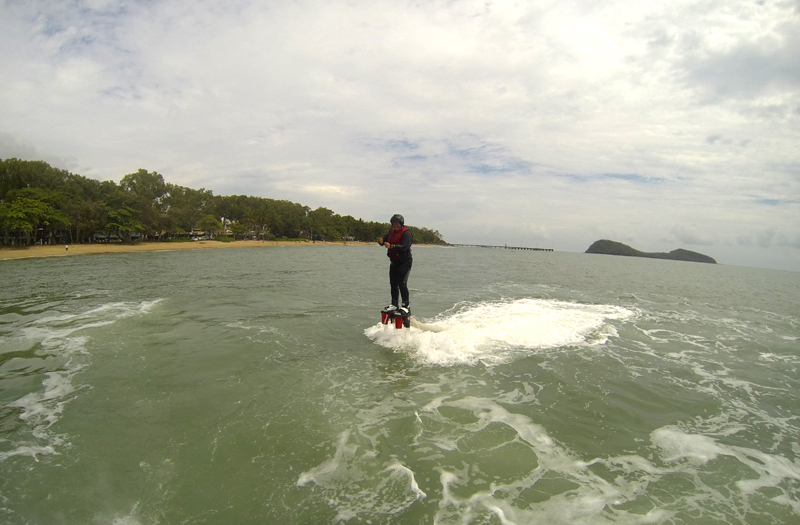 I didn’t even know Flyboard Cairns existed at that stage. With a mix of trepidation and anticipation I agreed to do it. After all, when the Universe brings you what you ask for it is only polite to go with it. Watching YouTube footage of the pros jetting 15m high did little to quell the fears of friends and family who know my mind often gets carried away with things my body is less capable of. But I knew I needed this. Balance and flexibility could be an issue – so I trotted off to an osteopath to ensure my spine could snake as much as the young bucks and beach babes on the flyboardcairns.com.au website – fat chance really. 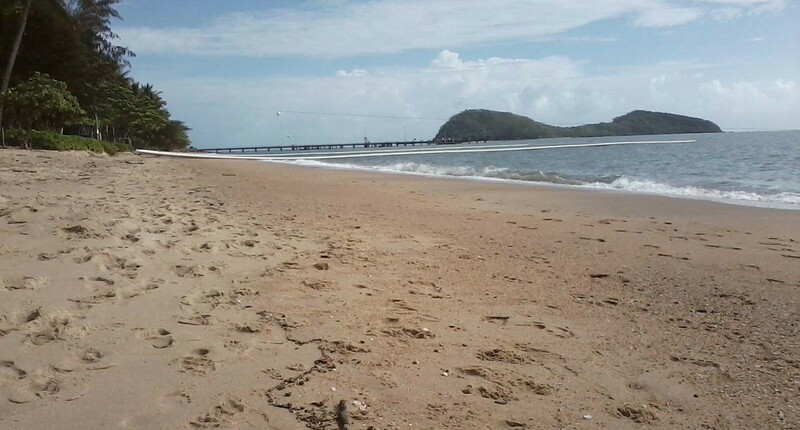 Come 9am Saturday and it is a sightly-overcast day at the beautiful spa-spangled Palm Cove, about 30 minutes’ drive north of Cairns. The gentle blue-green swell of the Coral Sea is enticing. I make a mental note of an advertising board offering discount massages outside one of the hotels – may be needed after I’ve finished. 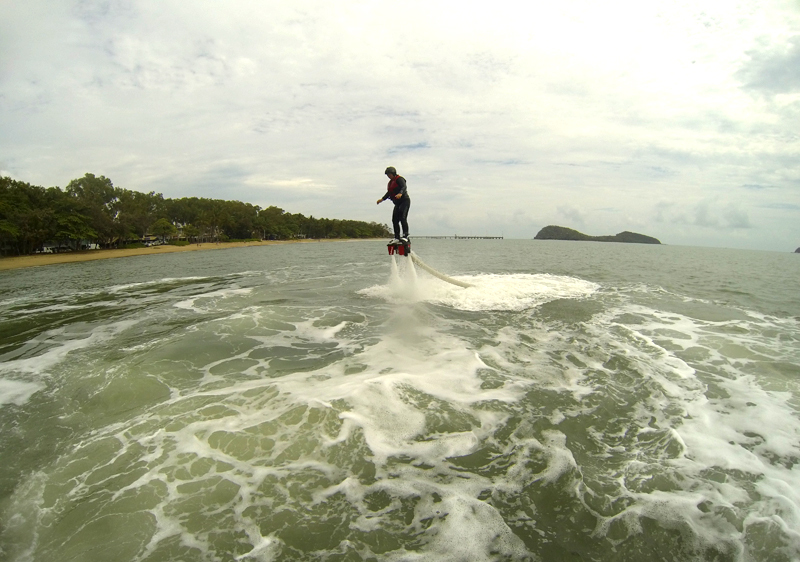 As I rock up to their beachfront setup opposite The Reef House resort, Flyboard Cairns director/instructor Luke Kanowski assures me it this brave new extreme sport looks a lot harder than it is. 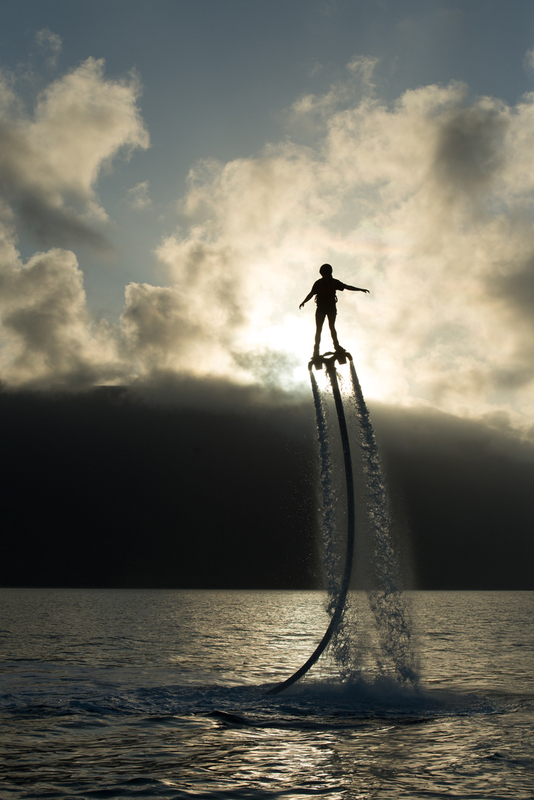 Fellow director Chris De Santo says it generally only takes 10 minutes of instruction to be standing up out of the water and 15 minutes to learn to manoeuvre on the Flyboard. There are no weight restrictions (big relief) and about 20 per cent of their clients are aged 55-70 (out go my preconceived ideas that this is just for the young guns). After squeezing myself into a full-body wetsuit and helmet, safety briefing over, and I join Chris at the jet-ski to get strapped into my jet-boots. Facing into the waves, the jet-ski powers up and the exhaust water quickly fills the 20m hose connecting us. As it exits the two metal pipes on either side of the Flyboard I start to move forward. The feeling is weird – effortless. Alternatively bending one knee or the other effectively controls your direction. We head for the safety of deeper water. I practice circling the jet-ski. Tilting my toes upwards and miraculously I rise up out of the water like some sea serpent. Nerves kick in as I get higher, losing balance and falling into the sea. Chris assures me that from the beach it would appear that’s what I meant to do. Yeah, right. We practice dolphin dives and work up to hovering. I make it up to 1.5m above the water. It feels more like 4m. I come crashing down on my side – my humpback whale breaching impersonation. Beginners can usually get up to 1-2m high, Chris says, up to 4m for those with nerve and balance. With extended repetition it is possible to hover up to 5-8m, he says, with pros reaching 15m and top speeds of 20km/h. “It is more about style and aerial stunts,” Chris says, which excites these pioneering sportsmen the most. “It is so new, we don’t know what we can do,” Luke says, likening it to the advances in skateboarding tricks since the 1970s. “We don’t know what is possible”. With that in mind, the guys are hoping to attract flyboarders for a North Queensland competition in 2014, with the aim of taking a team to national and world competitions at the Gold Coast and in Qatar at the end of 2014. So far the tricks include backflips, dolphin dives and variations such as the twister/tornado and corkscrew. It takes “twisting by the pool” to a whole new level. Thank you to Chris and Luke for blasting me out of a rut. And I didn’t even need the massage afterwards. Highly recommended. This entry was posted in Adventure, Far North Queensland, Travel and tagged action, adventure, attractions, beaches, Cairns, extreme sport, Flyboard, Flyboard Cairns, Flyboarding, inspiration, Law of Attraction, North Queensland, Palm Cove, Richard Branson, superheroes, travel on December 16, 2013 by smscott2.